Now that Miss America is being crowned people are looking for a reason to still hit the Jersey Shore. After the celebration of summer and the admiring of youth in the pageant, we often reflect on the many years spent at the Jersey Shore. Inevitable, these happy times and memories bring to mind those who are no longer with us. More people are seeking ways to communicate and find closure with the passing of their loved ones. Closure around this loss is exactly what two local mediums will be offering their audience when they present their show at the Atlantic City Aquarium, in Historic Gardner’s Basin in Atlantic City on September 22nd. These two, funny, light hearted mediums have been providing this service for many hundreds of clients, including celebrities, Fortune 500 company executives and police departments. 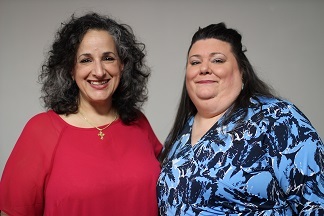 With combined mediumship experience of over 60 years Christine Gurganus of Haddonfield, NJ and Nora Truscello from South Philadelphia, a best-selling author and international speaker on intuition, leave clients laughing and crying. Gina Pozzi, a client at their last show, stated: “They delivered messages with love, compassion and a whole hell of a lot of comedy…be prepared to laugh and cry.” By the end of Christine and Nora’s shows, their audiences run out of tissues, even the complementary boxes around the room. If you are looking for one last reason to hit the Jersey shore before summer fully morphs to fall these seasoned mediums are the perfect excuse. Admission to show includes admission to the Atlantic City Aquarium. The aquarium’s provides sea life and animals exhibits, marine education programs and maritime exhibits.